As they speed around the track under the guidance of trained professionals, young drivers will naturally develop a lifelong passion for motorsports. Kids of all ages will delight in the incredible, hair-raising opportunity to test drive three classic muscle cars. Before they've even passed their test, kids can test drive three of the most recognisable, iconic movie cars in the world. Grown-ups can sit back and relax as youngsters cruise around the track under the safe and watchful supervision of a professional driver, who’ll teach them the rules of the road. As part of the triple supercar junior driving experience, young drivers can choose from three iconic cars. Whether they drive the sleek Porsche Boxter S or the Camaro ZL1, this will be one experience they’ll never forget. 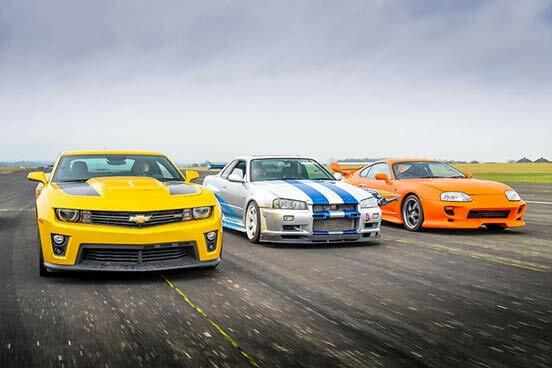 The jazzy yellow Camaro ZL1 is the original muscle car, built to rival some of the most advanced sports cars in the world. Kids will recognise this car from Transformers - it’s the same model that played the main character Bumblebee. The Nissan Skyline is another movie-famous car - recognisable as the motor Brian O’Conner drove in The Fast and the Furious. According to Top Gear, the Nissan Skyline might be the world’s fastest cross-country car. Young drivers will start their day with a welcome registration and safety briefing, where they’ll learn about techniques for driving on the circuit and rules of the road. Once they’ve been briefed, it’s time to put pedal to the metal and test drive some epic supercars. They’ll get to take three adrenaline-fuelled, thrilling laps around the track with each of their chosen models. A £25 supplement fee applies to Dunsfold, Blyth Park and Castle Combe venues. Drivers will be required to sign a disclaimer accepting liability in the event of damage to the vehicle. Drivers can purchase optional damage waiver cover when booking to minimise financial exposure in the case of an accident. Full details available at booking. This experience is available Monday to Friday, subject to availability, throughout the year. You must take your experience before the voucher expiry date. Awesome adventure for an 11 year old! Bought this for my son's Christmas present and used the voucher over the Easter school hol. We used it at Blyton Park in Lincolnshire which was a fantastic location run by Car Chase Heros. The event was run really well with the 3 different drives being about 30-45 mins apart with time to watch cars on the track in between. We paid extra for in-car video at the end however one of the memory sticks didn't work so we had 2 cars to take away rather than all three so don't rely on the technology but overall my son thought the day was absolutely fantastic, he is desperate to do it again! We bought this for our 12 year old last Christmas. Hes waited till Aug to use it. And he loved it. In his words it's the best present we've ever bought him. Good value for money, lots off extra so bring extra money.x he's now saving for the next driving experience for next year. Ordered this for my sons 10th birthday. Turned up on the day, joined the queue to book on for the day. All going well to this point. Waited for the briefing and then first session in first car. All going well so far. Stood around for hours waiting for 2nd car, only when I queried with one of the marshalls did I discover that he wasn't booked on the 2nd car. The guy on the desk resolved this when I spoke to him. Was a good day for my son spoilt only by standing round for approx. 5 hours in searing heat.